Many years ago while living on the East Coast, I used to take my daughters to a food court restaurant called, Cajun Cafe. Their bourbon chicken/pork was soooo good! I’d get mine with a little extra spice. Since I moved to Cali I craved it but hadn’t found a Cajun Cafe, so I decided to experiment. With bourbon, brown sugar, and a kick of cayenne… I think it’s as close as I can get to their version. I serve mine with a bit of dirty rice. I always make a large foil pan of it for Danny to take hunting, but instead of skewering it, he just leaves it in the pan to braise on a burner for about 30-45 minutes. His hunting buddies always ask for it. I substitute wild pork shoulder, or rabbit for domestic meat. The dirty rice can be made using ground wild game of any kind and I’ve also gone traditional using pheasant giblets and liver!!! Cut the game meat of your choice into 2 inch pieces or 3 inch long strips. Place them in a heavy duty zip lock gallon size bag or tupperware container. Heat the bourbon on a medium simmer for about 5 minutes, to burn off the strong alcohol taste, then cool completely. Add the cooled bourbon and all the other ingredients to the marinade, and stir to combine. Pour the marinade over the meat and refrigerate for 24 hours. Remove the meat and *** reserve the marinade. Skewer the meat and set aside. While skewering the meat, pour the reserved marinade into a small saucepan and bring to full boil and turn to medium high for about 5 minutes to reduce and use for a sauce (this step will kill any bacteria from raw meat). 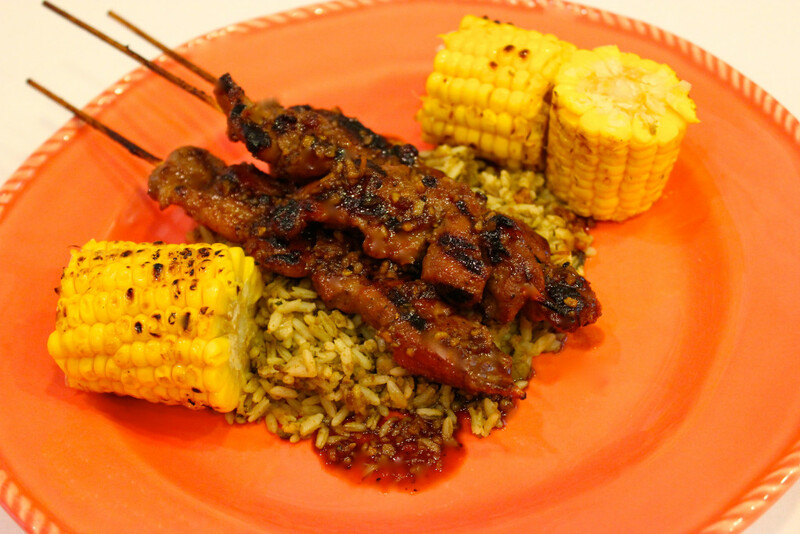 Grill the meat for about 4 minutes and serve with the reduced marinade, dirty rice, and vegetable of your choice. *You may eliminate the cayenne and red pepper flakes if you don't want it spicy.